Michael grew up on a dairy farm at Camden NSW and attended Camden state school. Michael studied mathematical sciences at the University of Sydney, receiving the degree of Bachelor of Science with Honours (First Class) in 1972. This was followed by a Master of Science in 1974, a PhD in Pure Mathematics in 1977 and a Diploma in Computing Science in 1979. Michael began his applied research at CSIRO Division of Land Use Research, Canberra in 1978. He rose to the position of Senior Research Scientist at the Division of Water and Land Resources before moving to the Australian National University in late 1987. He pioneered the development and application of quantitative methods for describing the natural environment. Key outcomes of this work included the first drainage enforced continent-wide digital elevation model of Australia in the early 1980s and the first continent-wide thin plate spline representations of Australia’s monthly mean climate in the mid 1980s. These elevation dependent climate surfaces underpinned the development of the BIOCLIM methodology. His foundation elevation gridding paper published in the Journal of Hydrology in 1989 has around 1500 Google Scholar citations. Michael moved to the Australian National University in 1987 where he served as Interim Director of the Centre for Resource and Environmental Studies from 2005 to 2006 and Interim Director of the Fenner School in 2008. His methods for modelling of climate and terrain, as implemented in the ANUDEM, ANUSPLIN and ANUCLIM computer packages, are widely used to support hydrological and ecological modelling and the assessment of the impacts of climate change. His terrain modelling program ANUDEM has been incorporated into Arc/Info, the World’s leading geographic information software system. His Australia-wide terrain and climate models have underpinned much of the natural resource and environmental analysis carried out by Australian Universities and Natural Resource Agencies over the last 30 years. 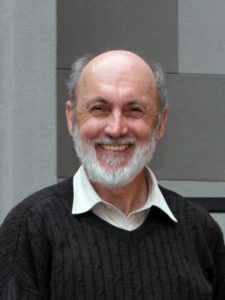 His foundation paper on interpolation of mean rainfall in the International Journal of Geographical Information Systems in 1995 has over 750 Google Scholar citations. His ANUSPLIN computer software package has over 600 Google Scholar citations. Main roles held at CSIRO: Senior Research Scientist, Division of Water and Land Resources 1985-1987. Research Scientist, Divisions of Land Use Research and Mathematics and Statistics 1978-1985.